Primer, and base, in general, is one of the things I take the most care of. I think primers can easily make or break a look and help your foundation really adhere. I don’t know about you guys but I am oily at the best of times, so I need something to make my base last. These two are my current favourites in my makeup rotation. 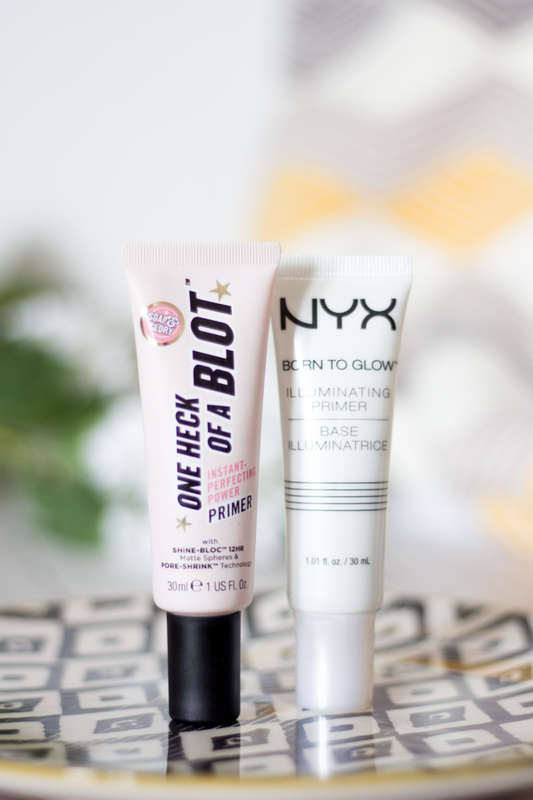 SOAP AND GLORY ONE HECK OF A BLOT PRIMER – For the times when I’m already wearing a super glowing foundation or needing my base to last all day, I reach for One Heck of a Blot. With more of soft cream texture, it adheres to the skin like a dream and makes applying foundation effortless. It’s lightweight and absorbs in to make the skin feel silky smooth and doesn’t feel like silicone, which I despise. Two thumbs up from me! NYX BORN TO GLOW ILLUMINATING PRIMER – NYX has quickly become my new favourite drugstore brand and, after not trying much of their base products yet, I decided to dabble my toe with this primer. For me, this is the best hands down. Now I love a glow and I’ve dreamed of getting the Becca Backlight Primer but it’s over £30 and right now it’s just not feasible. After looking up some dupes, the NYX primer came highly recommended. This baby packs a punch; or a glow should I say. Again, no slippy silicone feeling which is what I prefer. It is quite white, so girls with darker complexions might need to try before buying. What are your favourite primers? I’d love to know!